I don’t know if every new father has this continual thought in his head, or perhaps I’m just morbid and my brain runs rampant. It’s a subject I’ve often wondered about and something that I’ve long been fascinated with. When the Internet was just taking off in the mid-1990s I recall stumbling onto Rotten.com and just staring at the photographs of dead people. And it wasn’t because I had dial-up and had to wait for another page to load. I’ve sat and pondered my own inevitable demise — how am I going to go? Like my grandfather, surrounded by family? In a headline-making news item like a mass shooting? In an everyday car accident? Then I had a baby. And death became more of a concern of mine rather than something I entertained in my head every once in awhile. 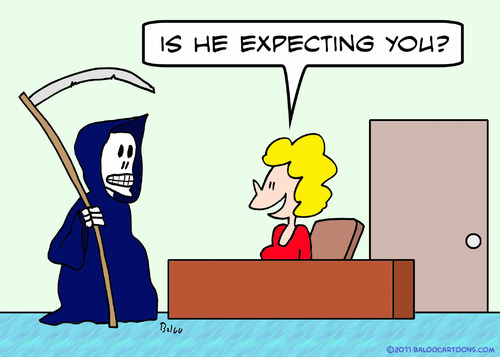 I had this sudden worry about my mortality. Rather than just thinking about it and moving on to a brighter subject, like taxes for instance, my idle thoughts of dying turned horrific. Not because of any new pictures I’ve come across (does Rotten.com still exist … hang on … yes, yes it does) or new imaginations of a possible end. These are cold sweat-inducing thoughts here. Who is going to be a father to my daughter if I were to perish? I had this thought for an entire flight home to Los Angeles from New Orleans back in June. The plane hit a small bump of turbulence and I immediately thought the worst. Which is bizarre because in my previous career I traveled 180 or so days a year for four years so air travel is not a concern for me. So, I thought, this is fatherhood? The worry of leaving your family too soon? It’s not like I set up a life insurance policy the moment we touched down at LAX. In fact, I still haven’t. But my thoughts of death still exist. Not so much the idea of who will be a father figure to my daughter, per se. My wife is hot, so she’ll inevitably end up with a great guy (obviously, she has one now). But my thinking is more along the lines of what I’d miss in this little fatherhood situation I got myself into. Roasting marshmallows hours after teaching her how to fish. The teaching moments. From practical: how to change a tire; to hilarious: mixing Mentos with Diet Coke. It’s these things that I’d have to watch from a different dimension. Even after I had shaken some of these thoughts weeks after landing safely, they crept into my head again. Sunday’s sermon at church was about death and resurrection and today Jehovah’s Witnesses left a pamphlet at my door about death. So even when I am enjoying a relaxing day off with my daughter, the idea continues to run through my mind. Everyday, to me, is a special gift — the challenges it provides and the successes you make of those 24 hours — so it’s not like I’m constantly letting my mind wander into into the morgue. Yet, death is kind of like life now. It’s not about me anymore. It’s about how everything would affect my daughter. It’s not so much that I would be missing out on those moments (although, technically, I would since I’d be dead). It’s that those moments wouldn’t feel complete to her if I weren’t around. Maybe I’m the only father who thinks this way. But I’m guessing I’m not. You are not the only one. Blogging as a dad has shown me how not unique I am. I, too, have had the random turbulence bump send me down morbid paths.